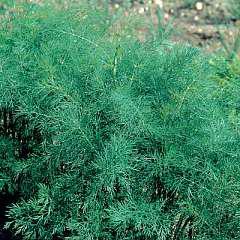 Dill (Latin name – Anethum graveolens) is a perennial herb with wispy feathery leaves. Dill will grow in most conditions, but the soil needs to be dug well before sowing the seed, so that its long tap root can grow down into the soil. Dill seed is easy to germinate. Sow the seed thinly in April & cover with a fine layer of soil. Thin the seedlings to 24cm (9in) apart. Only water when the soil is very dry, as the long tap root keeps the plant supplied with water. Use the leaves of dill to flavour fish, lamb, potato and peas. Dill is an easy & useful herb to grow, suitable for children and novice gardeners. We have an eBook on sale now which explains how to plant a herb garden or grow your own herbs for cooking. At a cost of only £4.00 the How To Grow Herbs For Cooking eBook will provide you with information on dill and many other herbs.